If approved, the hatchery would be the first substantial commercial enterprise allowed on the Mitchell Field property since it was conveyed to the town in 2001. 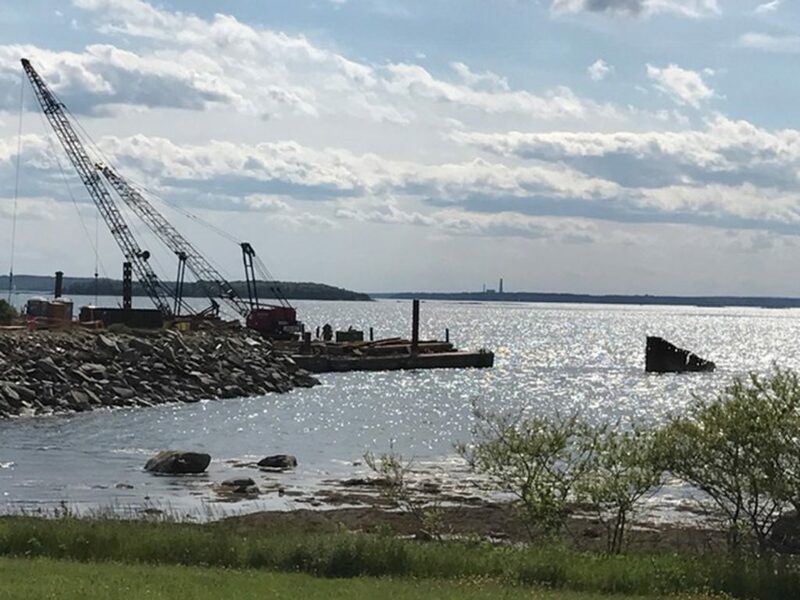 HARPSWELL — Since the town of Harpswell first took over Mitchell Field from the Navy nearly 20 years ago, officials have floated the idea of bringing commercial businesses to the location. Now the town is negotiating a lease with Running Tide Technologies Inc. of South Portland, which wants to open an oyster hatchery in one of the few structures remaining on the site. According to the lease application, the company would lease a 1-acre site on Mitchell Field, home of a former Navy fuel depot transferred to the town in 2001 that includes a garage and concrete pad. Running Tide would refit the garage to use as a hatchery, and the concrete pad would be used to store equipment. Pipes would be installed on either side of an existing causeway to take water from the ocean into the hatchery and then return it to the ocean. The company plans to treat the water before it’s discharged. The company also plans to include a pair of kelp beds – one near the intake and one near the discharge – that would help filter the water, Eyerman said. The owners of Running Tide Technologies did not immediately respond to requests for comment. The town has maintained the 119-acre former fuel depot primarily as recreational land. The property is a mix of meadows, woods and some beachfront dotted with old brick buildings remaining from when the Navy used the facility to transfer jet fuel from tankers to the Brunswick Naval Air Station via an underground pipeline. Last summer the town removed a crumbling pier, and this fall it demolished a water tower on the property that some had fought to save. The building drawing the interest of Running Tide hasn’t been used by the town since it was acquired from the Navy. As part of the lease agreement, Running Tide would renovate the structure, indicating it would replace the damaged concrete floor, fix the walls, rewire the building, install heating and repaint. “It’s essentially a total renovation of the building to bring it up to current use conditions,” Eyerman said. Full details of the lease are not yet available. Town selectmen have only discussed the project during closed-door sessions and have not released that information to the public. Currently, there are only two commercial oyster hatcheries in the state of Maine according to the Department of Marine Resources, including one in Walpole/Damariscotta and one in Bremen. Mere Point Oyster Co. is looking to expand its aquaculture operation in Maquoit Bay, but has met resistance from landowners and commercial fishermen to its 40-acre proposal. 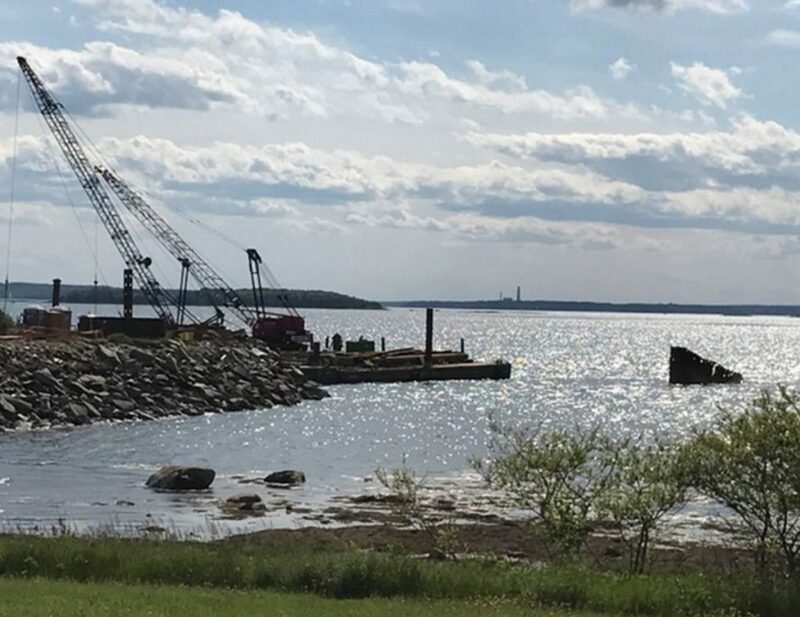 Georgetown Aquaculture has applied for a 27-acre aquaculture lease in Robinhood Cove in order to introduce Georgetown residents to oyster farming. Oyster farmers typically buy seed from the hatcheries for their aquaculture sites, where they grow them until they reach market size. Running Tide’s application did not indicate whether it plans to use the seed it produces for its own aquaculture operation or it intends to sell the seed to other oyster farmers. The Running Tide hatchery would not affect current uses of the beach or future plans for the waterfront, including a floating pier system and boat ramp, Eyerman said. If both parties agree to the lease, the oyster hatchery would be one of the first few commercial businesses to be located on the former Navy property. The only other business currently operating on the site is a small ice cream shop at the entrance, next to the fire station. If the arrangement proves successful, the owners also expressed interest in expanding with a cafe, oyster cookout area, water equipment rentals and educational programs. Although the lease terms are still being negotiated and the financial details of the plan have not been made public, a note attached to the application indicates that renovation of the Mitchell Field building could cost $500,000. The proposal has received Planning Board approval and could go before selectmen as early as next week. Correction: This story was updated at 10:30 a.m. Thursday, Dec. 6, 2018, to correctly identify the location of two oyster hatcheries in Maine.